A map of the predicted result. I’ve decided to update my prediction of winnable SNP seats which I wrote two weeks after we lost the referendum. At the time it seemed incredibly optimistic, but since then it’s been overtaken by lots of polls by YouGov and other well-known SNP cheerleaders. Apart from the much more positive opinion polls (from an SNP point of view), the past months have also seen the publication of Lord Ashcroft’s constituency polls (which found a greater-than-average swing towards the SNP in Labour-held constituencies) and more recently by tactical voting polls. Shockingly, it looks like the LibDems and the Tories might fare slightly better than expected due to the inverse Ashcroft effect (if the swing towards the SNP is greater in Labour-held seats, it must be smaller in other seats) and tactical voting. 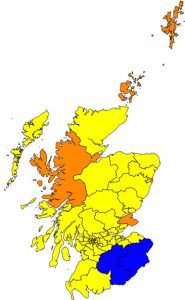 If this prediction is correct, the Lib Dems will hold onto three of their seats, the Tories will go from one to two (by winning a Lib Dem seat), Labour will be reduced to one, and the SNP will win the remaining 53 Westminster seats. Your links appear to be broken. Any I have clicked tell me the page can’t be found and offer me a search box – would you care to check this out? I’ve now made the links absolute — could you please try again? What Scotland wants is very clear. It’s English politics that are a mess. Tried again as asked – links fine now. Enjoyed your analysis, glad you think it is only through tactictal voting that Charles Kennedy may retain his seat – I promise we’re trying. http://t.co/L7Rz7euO0a I’m going to bookmark this one. It’s an exercise in educated guessing, with good SNP news, so let’s see on May 7th.